The art of “making music” in this digital age… When you really think about it, how incredible is it that as music-creators we can take something from our minds, and sculpt it into something tangible? No matter how novice or professional you are, no matter what others think or say about the music YOU create, there’s no denying that we are living in an incredible time of opportunity for crafting music. A while back I was introduced to a gentleman and composer working in SONAR out of Northern California by the name of Jerry Gerber. I knew he was a great composer from his accomplished list of credentials, but what I wasn’t prepared for was being absolutely fascinated by the sonic depth of “his sound,” the detail and integrity of his tracks, and moreover—how he accomplishes all of the above mentioned. When you listen to his work, and then hear his theoretic viewpoint of how to correctly compose and produce music, you quickly realize that this guy has tapped into something a bit deeper than most musicians. What really made an impression on me was that without ever using the Piano Roll View (PRV), Jerry Gerber has composed and produced for some very highly-profiled films, television shows, computer games, concerts, dance and interactive media, and also back in the day wrote all of the original music for the remake of the popular children’s television show, The Adventures of Gumby. 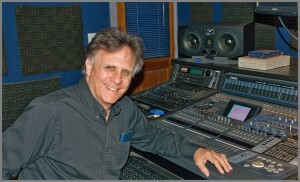 His approach to all this is through an expert level of “MIDI Sequencing” which he explains in the newest edition of the SONAR Newburyport eZine. I was intrigued and beyond impressed by his words in the eZine, so I decided to [self-indulgently] dig a bit deeper by reaching out to Jerry to get some insight on his methods of madness with his new record. His words of musical wisdom make a lot of sense for anyone creating music in any genre, and I highly recommend the read; and then applying what you learn by analyzing and enjoying his new full-length composition. [Cakewalk]: You talked a lot about the “programming” aspect of the new record, but what was the “writing” process like for you? [Jerry G]: Composing nowadays involves a two-step process: I do a lot of free improvisation on the piano, which generates ideas. Stravinsky once mentioned how important it is not to have “contempt for the fingers,” meaning, in my interpretation, that what our hands do spontaneously (governed by mind of course!) may be inherently musical and expressive and we should not necessarily throw that in the back seat for the sake of further abstraction. My improvisations involve no notation, no recording, nothing memorized—it’s the raw, spontaneous joy of making music and experiencing a sense of oneness with the sound, the closest analogy is meditation. I find that this process is a check on over-intellectualizing the composition process. When writing intricate music, it is tempting to come up with ideas that seem great, but don’t actually work well as sound. Music is about ideas and about sound. No matter how complex, clever or ingenious the ideas, they have to work as sound. Improv really helps to maintain that balance. The 2nd step is going into the studio and composing. I open SONAR’s staff view and begin by popping notes onto the staff with the mouse. I generally begin with either a harmonic idea, a melodic idea, or even a tempo. There’s no one way to begin a piece. I think of composition as controlled spontaneity, part of the mind is feeling, sensing, imagining and listening (as in improv), the other part is involved in the technical processes of notation and sequencing. Before computers, I relied upon paper, pencil, piano and metronome. If someone would have told me 40 years ago I’d be producing symphonic music from my studio using computers and software in the not-too-distant future, I probably wouldn’t have believed them. 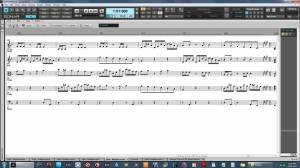 While working on a piece I’ll sometimes print out a rough draft of the score and study it, but most of the composition process takes place in SONAR’s notation editor. I also use the event list a lot for inserting program changes and individual controller changes. [Cakewalk]: Your new record is an amazingly balanced and tasteful bliss of intricate structure. What features and views in SONAR do you use technically and can you briefly share any examples of how the process flows in SONAR? [Jerry G]: Thanks! I spend most of my time in the staff view, the event list and the controller view while composing. After the composition is finished and the MIDI programming is complete, I render the MIDI data to audio and work with volume envelopes and signal processing. When writing orchestral music, I rarely play ideas into SONAR; I prefer to enter them via the mouse. There’s a lot of editing of note lengths, attack and release times, velocity and patch/articulation changes that need to be input, so it’s not faster for me to play the music via a musical keyboard. [Cakewalk]: How does the programming for the percussion and drums work in your projects? 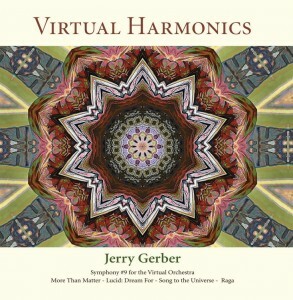 [Jerry G]: If I am using percussion from the VSL orchestral library I treat them as I do any instrument, creating a separate staff for timpani, snare, etc. If I am using a drum kit software plugin (I use EZ Drummer) I’ll create a groove in EZ Drummer and export it as a MIDI sequence into SONAR, placing the percussion pattern where it needs to go in the composition. It’s also not unusual for me to play percussion parts in via a music keyboard. [Cakewalk]: What do you like about SONAR Platinum over the previous versions of SONAR? [Cakewalk]: What is next for you after releasing this record? [Jerry G]: I’ve begun work on my 14th album, starting with some short piano pieces.